One hundred firefighters are tackling a massive blaze at an industrial waste factory in north Melbourne. 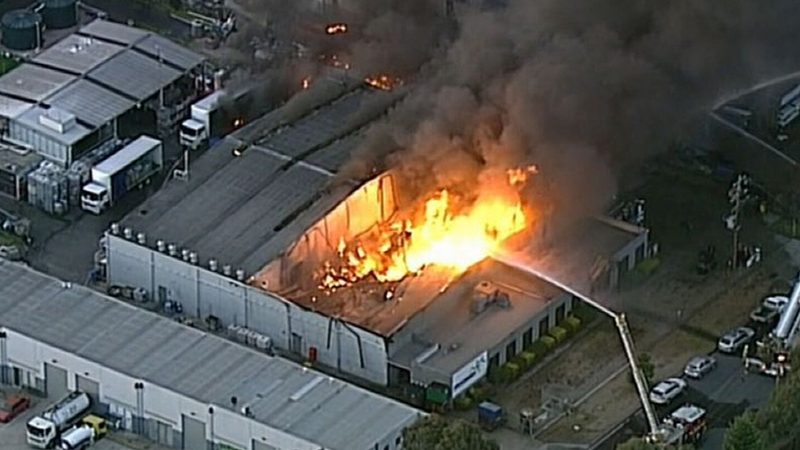 The fire broke out in a factory provides storage for industrial and hazardous waste at Thorneycroft Road in Campbellfield, in the city’s north, earlier this morning. Thirty people at the Bradbury Industrial Services site fled as the fire took hold. Hazardous industrial material is ablaze and toxic smoke is billowing out. One witness told 9NEWS he saw barrels flying in the air earlier this morning as the fire took hold. A Metropolitan Fire Brigade spokesman told 9NEWS the fire has been contained but there are a number of running fuel fires. He said hazardous material was inside the factory and the blaze would likely last for a number of days. Alex Paul who worked at a neighbouring site said he heard screams of “Get out” as workers fled the scene. Explosions are still being heard as firefighters struggle to control the fire from spreading. Bradbury had its licence to handle the hazardous material cancelled two weeks ago. One person has been treated for an eye injury, Ambulance Victoria said. Students and parents at a local primary school are being urged to stay away today. Holy Child Primary School is about three kilometres from the factory. Principal Allan Smith said the smoke is visible from the school. Toxic smoke and giant flames are pouring out, and authorities are warning residents, especially people with breathing difficulties, about the danger of inhaling smoke. Thick black smoke is billowing across the area and into neighbouring suburbs and south towards the Melbourne CBD. One hundred firefighters are on the scene. Aircraft have also been deployed to tackle the blaze.